Popular faith-based production company Pure Flix Entertainment announced on Tuesday that it will be releasing the Bible epic "Samson" in theaters nationwide. 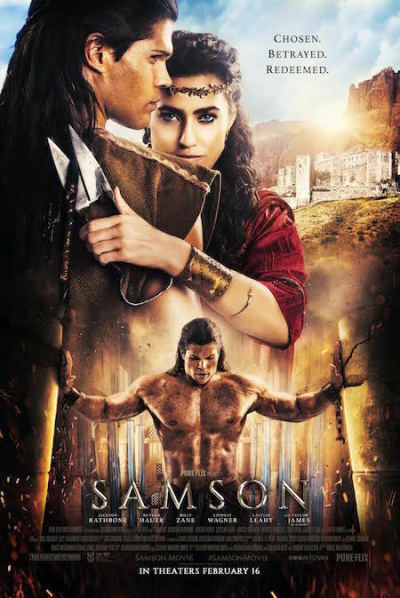 Hitting the silver screen on Feb. 16, "Samson" will feature Billy Zane, Golden Globe winner Rutger Hauer, Jackson Rathbone, Lindsay Wagner, Caitlin Leahy and Taylor James as Samson. "'Samson' is based on the powerful, biblical epic of a champion chosen by God to deliver Israel. His supernatural strength and impulsive decisions quickly pit him against the oppressive Philistine empire. After being betrayed by a wicked prince and a beautiful temptress, Samson is captured and blinded by his enemies. Samson calls upon his God once more for supernatural strength and turns imprisonment and blindness into final victory," the synopsis reads, according to a statement shared with The Christian Post. The production was filmed on location in South Africa and Pure Flix says the journey of the biblical figure will showcase "passion, betrayal, and redemption" which will inspire audiences to "realize that life's failures need not define their future." "For anyone who ever wondered if they really could do what God called them to do, this film is for them," Pure Flix CEO Michael Scott said in the statement. Director Bruce Macdonald added, "Most people know that Samson had long hair, Delilah cut it off, and that he lost his strength. But there's so much more. Samson was an unwilling hero, and his journey to regain his faith — the whole story — is relevant in 2017." "Samson" was written by Zachary Warren Smith, Jason Baumgardner, Galen Gilbert, and Timothy Ratajczak. The team at Pure Flix behind the $100 million 2014 blockbuster "God's Not Dead" — David A.R. White, Michael Scott, Elizabeth Travis, Alysoun Wolfe, Vlokkie Gordon, Bruce MacDonald, Craig Jones and Brittany Yost — were involved in the production of "Samson." For more information on the February 2018 release, visit the film's website.